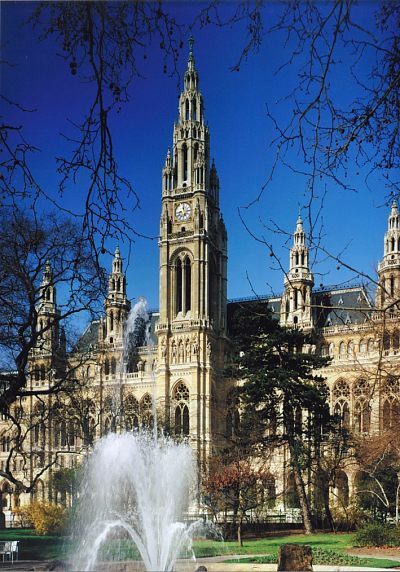 The City Hall is one of the most splendid amongst the numerous monumental buildings along Vienna's. Designed by Friedrich Schmidt (1825-1891), it was erected between 1872 and 1883. The architecture of the Ringstraße is dominated by historicism. In Historicism various stylistic elements of the past were combined into a style in its own right. Friedrich Schmidt however orientated himself just on one particular epoch. The City Hall was built in gothical style, with a tower similar to gothic cathedrals. The gothic era saw the growth of the cities and the emergence of an urban burgeoisie. Today the City Hall is the head office of Vienna's municipal administration. More than 2000 people work in the building. Visitors are stunned by the magnificent appointments of the state rooms, which frequently provide an atmospheric backdrop to various events such as press conferences, concerts or balls.